JESUS MAFA. Jesus multiplies the loaves and fish, from Art in the Christian Tradition, a project of the Vanderbilt Divinity Library, Nashville, TN.http://diglib.library.vanderbilt.edu/act-imagelink.pl?RC=48287 [retrieved July 31, 2017]. How would you describe God? How does Psalm 145 describe God? 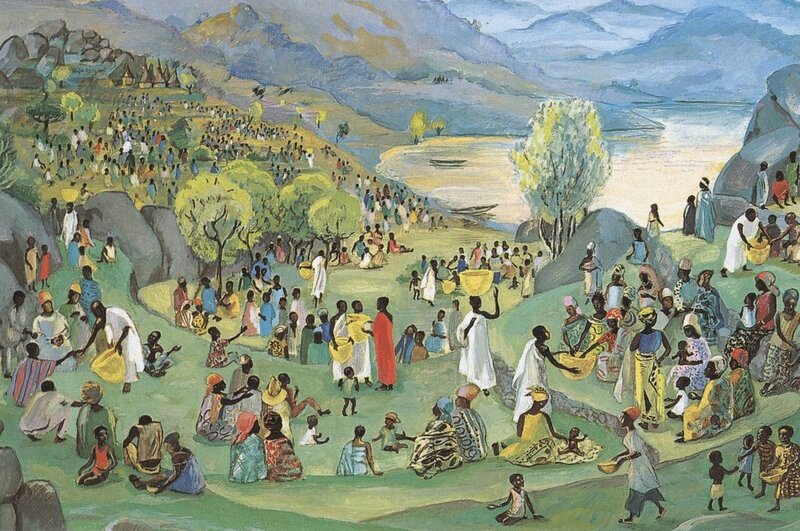 ​Look at the image above: find Jesus who is wearing a red robe, find the disciples who are wearing white. Everyone else is the crowd. What are the disciples doing? What else do you notice about the picture. Read the Matthew reading as you look at the picture. Click here for a reflective colouring sheet with a reflection on the Matthew reading. Use a word cloud to write/draw your reaction to the Matthew reading. Go to Our Stories page to see a post about songs that we didn't get to sing. Sing some of your favourite hymns or songs & praise God. What other verses in the Bible can you find about singing? Click here for an activity based on the Zephaniah reading & find out why God likes you. Use this prayer walk scavenger hunt idea to combine physical activity with spiritual activity. Use this idea to have a faith interview as a household or to interview someone you know. Go to our Life with God section for links to lots of ideas.